Hey, have you ever wondered what it feels like to be a surgery dentist and cut open people? It is a scary feeling. Isn't it? If you are not one of those chicken-hearted people who pass out upon seeing blood, you may well find it interesting and curious. Despite your interest, you will never get an opportunity to operate on someone, unless you are a medical student. Don't worry! Even if you have the faintest urge to become a dentist, the following game let you do that on your mobile phone without getting your hands wet! 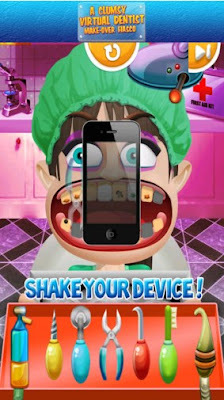 Take a look at one of the best dentist simulation games for mobile. What is A Clumsy Virtual Dentist Make-over Fiasco all about? We’re talking about a virtual dentist game called A Clumsy Virtual Dentist Make-over Fiasco, developed for all iOS users that want to have hours of simulation fun, anywhere and anytime. 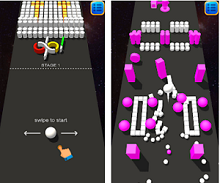 This awesome game app is designed for both iPhone and iPad, shines with intuitive touch screen controls and fantastic graphics. The story behind A Clumsy Virtual Dentist Make-over Fiasco is very interesting. The town has major dental issues and you're the only one that can help them. Get ready to have your own dentistry and prepare your tools o remove those rotten teeth! See what the problem is and fix it, by putting fillings in their cavities, and don’t forget to use your scraper to get them shined up nice! After you’ve worked your magic, take a picture of your patient’s beautiful smile and share it with your friends and family. You can download this cool and entertaining game for free from the App Store’s link below.